Dressed in white shirt and pants, three time Bhartiya Janta Party (BJP) corporator Manoj Kotak is now contesting from Mumbai north-east constituency. Kotak, representing BJP in the BMC, is ready to rally around Ward 125 in Ghatkopar east area. It’s about 7:30 pm on a hot April evening and supporters from within the BJP and alliance partners Shiv Sena and Republican Party of India (RPI) holding respective party flags and garlands have been waiting to welcome their candidate with drums to embark on ‘Prachar Pheri.’ BJP leaders Kirit Somaiya – whom Kotak has replaced for the constituency – and Prakash Mehta have also arrived to join the rally. “Our workers have good personal contacts with locals and we do not have to identify ourselves as BJP workers as people already know us. With Amit Shah ji calling for strengthening booth levels all those with last mentality have woken up now,” says another party worker. 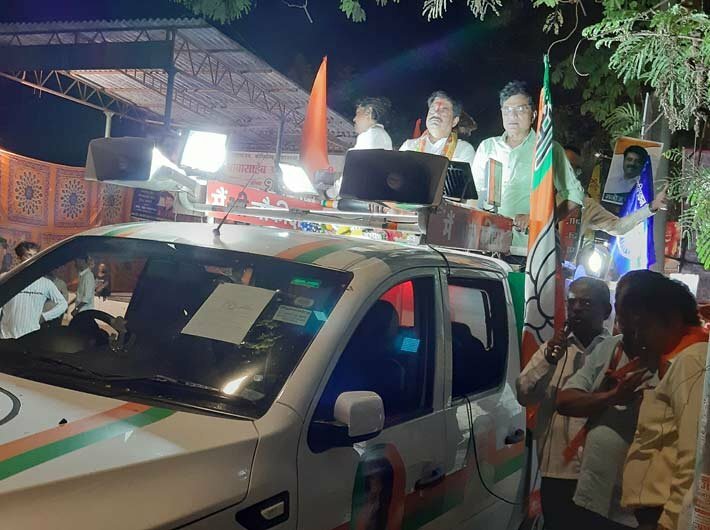 Passing through dusty and congested lanes of Ganesh temple, railway police quarters at Ashtvinayak Society, Samata colony the rally winds up at BEST Colony where supporters and workers are offered vada pav. Kotak is contesting against NCP candidate Sanjay Dina Patil in the assembly segments of Mulund, Vikhroli, Bhandup west, Ghatkopar west, Ghatkopar east and Manhurd Shivaji Nagar.